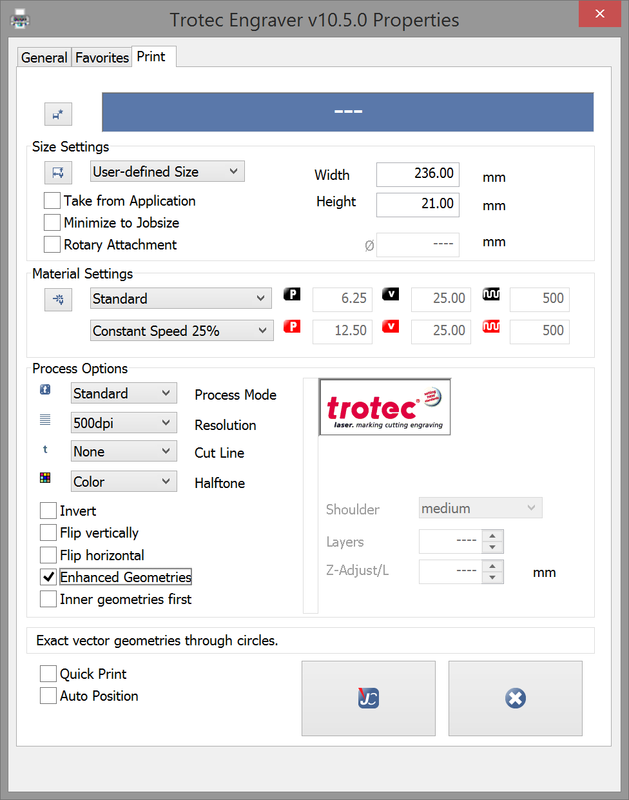 In this article we will learn how to use the Constant Speed Test Pattern, in order to find the power and speed setting suitable for your material. Firstly, it is important that you download the files needed, they can be found HERE. Once the files have been downloaded, extract the zip file in a folder or on the desktop. Next we will need to open JobControl and import the Material templates. 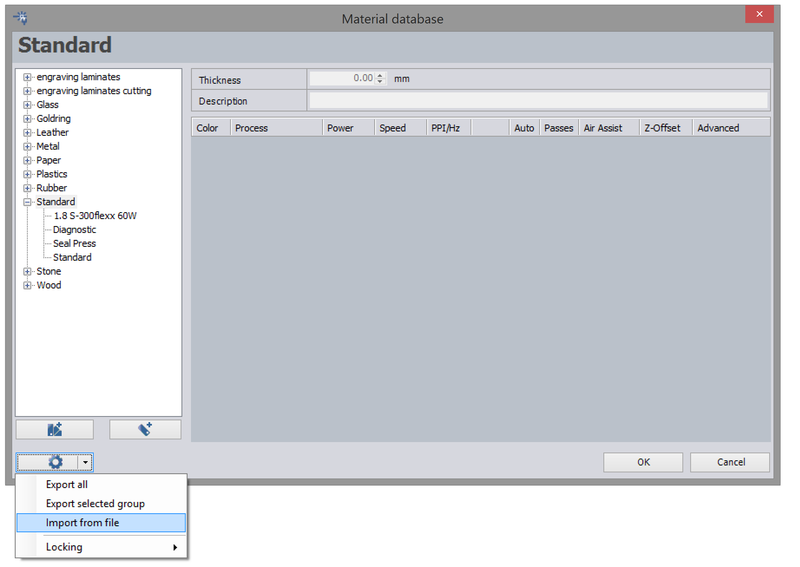 By clicking “CTRL + M” after opening JobControl, the material database window will pop up. Navigating down to the “Options” icon, press the “Import from file” option. 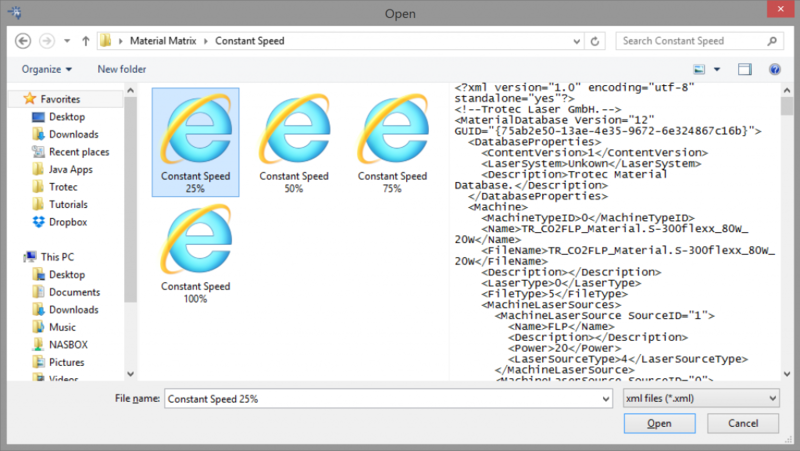 Next, we have to navigate to the folder where we extracted the .zip file and find the file called “Constant Speed 25%”. This files, file type is .XML. Once you have clicked the file, press “Open”. You will later need to repeat this step for all the other .XML files (50%, 75% and 100%). The next window you will be greeted with is the “Material Import” window. 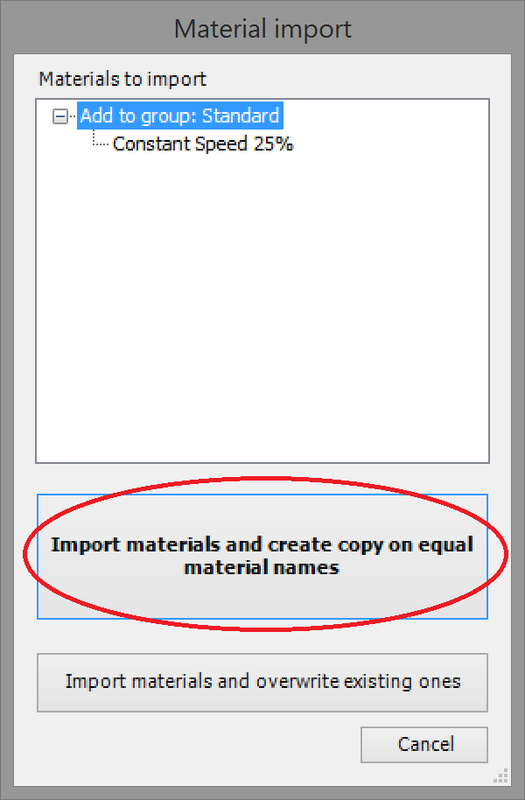 When presented with this window, please click “Import Materials and create copy on equal material names”. 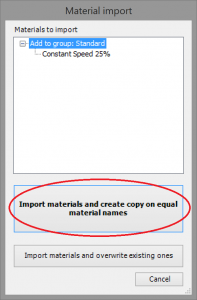 By clicking this option, it will prevent overwriting a material file with the same name. 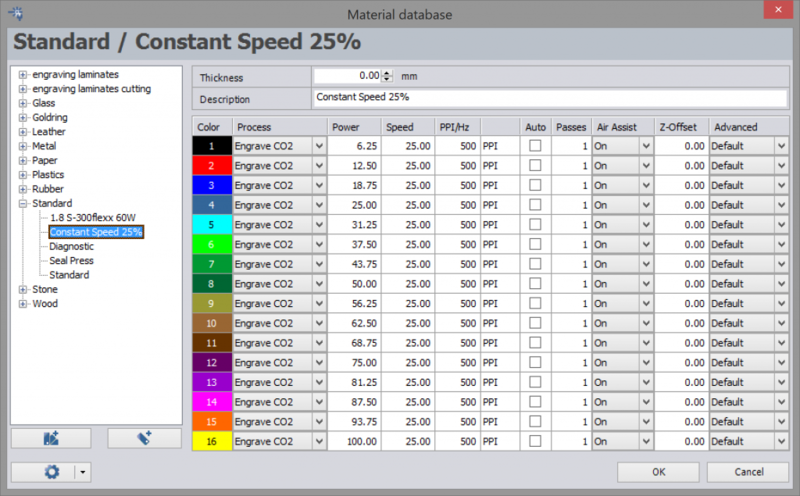 As you can see, once imported, the new material will be stored under the material group “Standard” in a material called “Constant Speed 25%”. 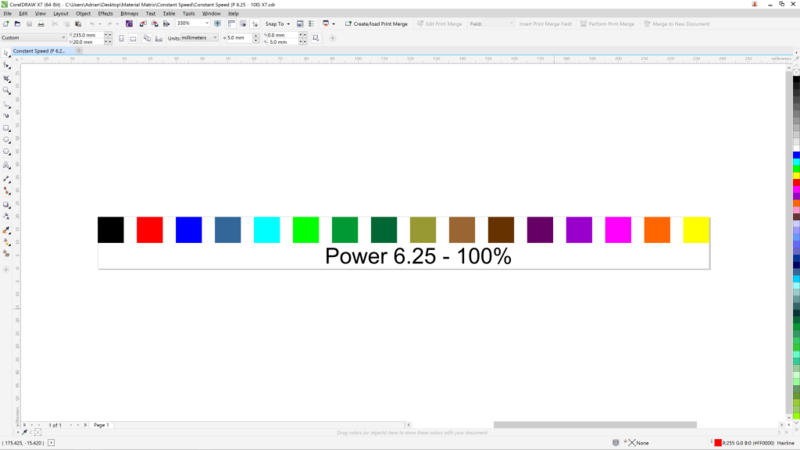 NOTE: As you can see in the image above the power and speed settings increase at a rate of 6.25% per colour. Each colour will have a constant speed of 25% and only the power of the laser will increase. You can skip certain colours, if you think that they will damage the material you are testing. For Example 100 power, 25 speed will put the most power into the material which could set fire to it. Please be aware, that if the material under test is flammable or can be easily damaged due to high heat, please skip this engraving colour. Now that we have the material in the material database, please restart JobControl to save the changes. Once JobControl has been restarted, the material will now be stored in the material database. These steps will need to be repeated for the other 3 material templates. Please repeat this step for the 50%, 75% and 100% speed test patterns. Now we will learn how to use the Constant Speed Test Pattern. When you open the “Constant Speed (P 6.25 – 100)” file, you will be greeted with this view. You will then be greeted with the “Print Properties” window. Please click the “Preferences…” button to set up the printer driver. 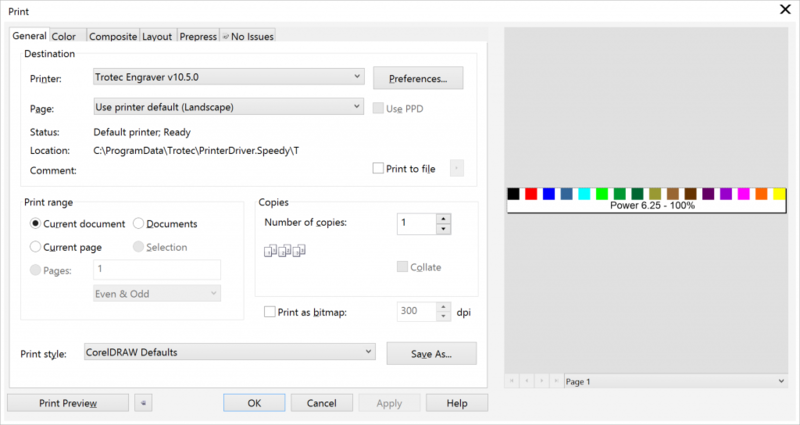 The printer driver settings should look like the image above. NOTE: Please take care to make sure the correct material is selected in the “Material Settings” section. This should have the correct Constant Speed material selected. Constant Speed 25% will run the laser with 25% speed, 50% for 50 etc.. 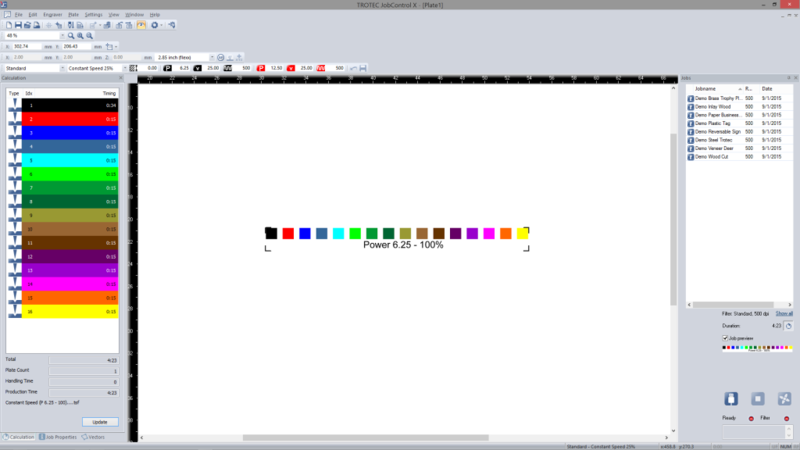 If everything is done correctly, you should see the test pattern in JobControl with each colour selected. Again I must stress, if your material under test is flammable or can be easily damaged due to high heat, please skip any engraving colour that might cause damage to the material. An operator must be supervising the material testing at all times. By using these test files, you as the operator of the laser, take full responsibility for any damages caused by the misuse of these files. This is such great content and very helpful to me. I am wondering would you consider articulating how you decipher the results of these tests into your work? Maybe talk a little about the ways it affects your decisions and provide a little real world context. It would be quite interesting to have your insights on how this affects your work after seeing the results. Also, I am interested in making or finding a test that helps identify or narrow down quickly the optimum cut parameters for any given material. Thank you again for sharing your hard work, I recently purchased a Trotec Speedy 300 ( 60 watt ) and this is very much appreciated. From material to material and from job to job, the requirements differ… thus this test was designed in a way that would let the operator visually see the differences that power will make on your material. In some cases if you use too much power you can actually damage the material which results in an unexpected finish. A good example of this is Anodized Aluminium. Medium power and high speed works well, but if you keep increasing the power past a threshold, the laser starts taking the anodizing off and eating into the aluminium. Using this test we can see where in the power band gives best results.